The next upcoming Hanukkah is on sundown of December 22 ending at sundown on Monday December 30th, 2019. Hanukkah is an eight-day Jewish festival with the first day known as Chanukah, Festival of Lights, and Feast of Dedication. In the Jewish calendar, the first day of Hanukkah is on the 25th day of the month of Kislev. In the Gregorian calendar, Hanukkah may occur between late November to late December. Hanukkah commemorates the Holy Temple rededication in Jerusalem. 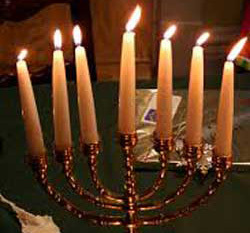 It is observed with candle lighting of the candelabrum which is a nine-branched menorah. Each night an additional candle is lite, progressing to eight on the final night. Other festivities include gifts, playing dreidel, and eating foods like doughnuts and latkes. Hanukkah become more popular in the mid-nineteenth century as Jewish Americans adapted to American life. Hanukkah involves the observance of the rededication and ritual cleansing of the Holy Temple from victory over the Greeks in the Maccabean War in 162 BCE. The Chanukah, also referred to as the Festival of Lights, stems from the small amount of consecrated oil for lamp burning would only last one day, and miraculously it lasted for eight days.